Deep within a labyrinthine mine lie deposits of gold, and being the intrepid miner that you are, your aim is to retrieve as much treasure as you can from the mine while dodging the many hazards that lurk within it – including dragons! You have an oxygen tank for travelling through flooded areas, and a battery for your lamp; if it runs out, the game is over. You have a supply of spare batteries and oxygen tanks, but you can only carry up to four items at a time while you're in the mine. It's easy to get lost, so making a map is essential. The graphics are rather simple, but the biggest problem is that hazards appear randomly, which makes it difficult to predict them, causing lives to be needlessly wasted. The music is also annoying, mainly because it keeps randomly speeding up and slowing down! Enter the Deathscape and take on the Varg empire. 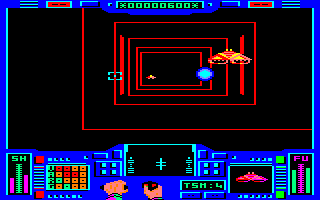 This game is a trench run where you fly down a corridor of sorts blasting away at approaching baddies. 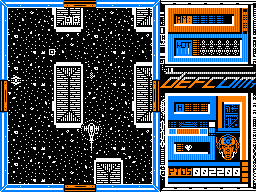 The colourful sprites move quickly and without flicker, and the vector graphics give a good impression of speed. 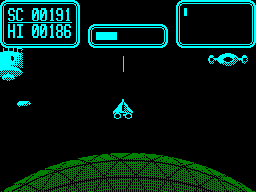 The control panel at the bottom of the screen displays shields, fuel etc. and an animated hand gripping the joystick. As for the sound, it's a case of shooting and explosion sounds. Overall, you will quickly become bored by this game. Watch a YouTube video of this game by: ZEUSDAZ. Another of those games where you must escape from a labyrinth of dungeons and caves, fighting skeletons, orcs and ghosts, opening doors, collecting spells, and releasing some prisoners along the way if you have some release spells. The graphics are extremely well drawn and the music is so atmospheric and eerie! The only problem is that the game is too difficult, and it is made harder by only having one life; if you die, you have to start all over again. New York's streets are overrun with gangs, and the police can't handle it, so the chief has done a deal with vigilante Paul Kersey and allowed him to go and kill as many gang members as he can. You play Paul in this rather violent game, based on the equally violent film of the same name. You wander the streets with a variety of guns, scoring points for killing gang members, but losing points for killing policemen and little old ladies. You also need to raid apartments to find more weapons and locate the gang leaders and kill them. As already mentioned, this is a violent game, with bodies being graphically torn apart and blood flowing everywhere when you shoot anyone with the rocket launcher. However, the game doesn't have much depth, and I often became disoriented when using the map and compass. Fight an onslaught of enemy submarines single-handedly in this simple shoot-'em-up. 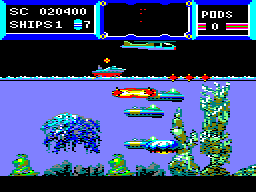 You control a boat at the top of the screen, and you must destroy the submarines using depth charges. Some submarines will release a pod when destroyed, which floats to the surface and releases a flag. Collecting this flag alerts a helicopter, which drops one of several types of power-up. Every so often, there is a token to be collected from the seabed, and you must collect it by transforming your boat into a pod and sending the pod down to the seabed. There are also several intermediate stages that you must complete before you can progress to the next level. The graphics are reasonable, but the game becomes rather dull to play quite quickly, and the Missile Command-like intermediate stage is particularly boring. In this offering you take to the skies, World War I-style. You take the role of a fighter pilot escorting a bomber over enemy lines. 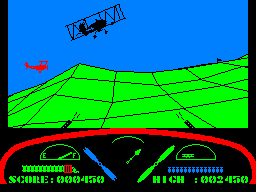 The gameplay sees you in your cockpit with the bomber ahead of you. Pressing the SPACE bar signals the bomber to deploy its payload, which at times seems hit and miss; you can't aim properly. 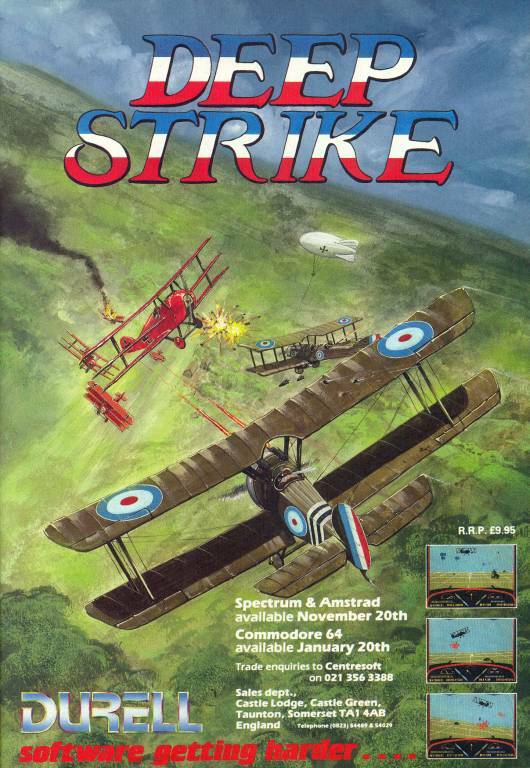 Several enemy aircraft swarm in and attack, and this is where you come in – but be careful not to hit the bomber. The graphics are vector-based with an effective terrain moving below you – watch those hills! As you play, you actually begin to feel like you're flying as the landscape banks and rises towards you. The game is difficult to master but fun all the same. By 2056, the Star Wars satellite defence systems were ready, with eight satellites orbiting Earth. There was total peace for many years, but now aliens have taken over the satellites and started attacking Earth. You are Captain Nick Diamond, and your mission is to destroy the satellites with the sole remaining spacecraft available – the fairly standard Eagle Class E751. Your spacecraft is equipped with a cosmogun, but as you destroy more aliens, you can use a fazalaza, a dyno ray, and a blaster – the only weapon that can destroy the satellites. However, you have to blast a lot of aliens to obtain the blaster, and this is so tedious and repetitive that it's not worth the effort. 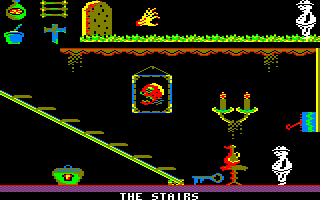 The graphics lack colour as well, although the music is excellent. It's 1992, and there has been no conflict between the world's superpowers for many years – but there is now a serious threat to Earth, a threat so serious that the World Security Council has been put on DEFCOM 1 (er, surely it should be DEFCON 1?). Those aliens are up to no good again, and they've been detected in the Vesta-7 sector of Ceres. 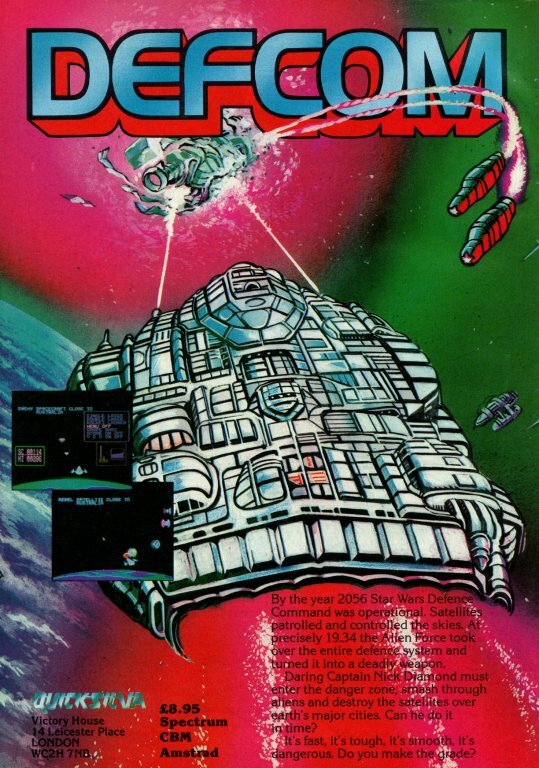 This is a shoot-'em-up in three parts, and you control a different vehicle in each part. You have to fly to the space shuttle launch site in a helicopter, then fly the shuttle through an asteroid belt, and then take on the aliens in a space fighter. In the first and third parts, you also have three smart bombs. This is a mediocre game, primarily because it's a Spectrum port, but there are also no power-ups, and the sound effects are very poor. Defence is a brilliant and original strategy game which is influenced by the demo scene with its overall presentation. In this marvellous and smartly programmed gem, you have to place your defences in such a way that the enemies are destroyed before they reach the exit. You have four types of defence, each with different attributes. The enemies also have different abilities. The levels are intelligently designed and they pose challenges as to how to set up your defensive perimeter. The graphics are great, although the animation and movement of the sprites are jerky. The sound is truly magnificent with a fantastic tune – one of the best I've heard on the CPC – playing throughout the game, and there is some digitised speech too. The gameplay is remarkable; it's highly addictive and the difficulty is correctly set. What else could you ask for?